Note: I tread lightly on this political lightning rod. I'm coming at this topic from an operational rather than political point of view. And, I'm only surfacing an impact of the minimum wage that doesn’t seem to be included in current discussions. I haven’t looked at the ASAE Operating Ratios report for some time but as I recall, “personnel costs” represent anywhere from one-third to one-half of the total operational costs for “typical” associations and nonprofits. The same percentage applies to most association management companies (AMCs). Thus, total cost of salaries represents a major component of the economics for most association professionals. Since I always paid more than the minimum wage, I assumed the issue did not impact either my AMC or the associations I served. I discovered this when my AMC was a 4-staff infant. At about that time (in the late 1990s), Congress was debating whether to increase the federal minimum wage. After overcoming my shock, I realized that she wanted to be sure she was paid above the minimum wage at the same rate as she was then receiving. 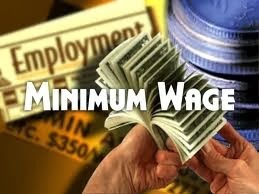 Now, I understood that the minimum wage affected me because it increased the wage/salary rates for all the staff we employ. And, that is the hidden secret of minimum wage rates and the element that is not discussed. For associations and nonprofits with paid staff, a key question becomes how do we increase revenue to cover a one to three percent increase in the total cost of personnel? Will we increase member dues? Generate more non dues revenue? Increase donor contributions? Increase conference registration fees? Or, will we cut costs and services? My intent is not to stoke the fires of debate but to alert association professionals that changes in federal (or state) minimum wages impact more than those paid the minimum wage.